Commander: U.S.S. Defiant. When you play this personnel, you may download a ship. "Let's just say we're preparing a few surprises just in case the Dominion comes through the wormhole." Characteristics: affiliation, download, download - ship, Deep Space None related, Commander, personnel who has a cost of 3 or more, personnel who has a cost of 4 or more, Benjamin Sisko, Human species. Requires: Deep Space None related. 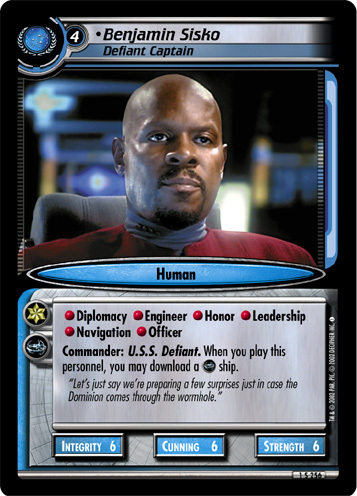 There are 12 entries for Benjamin Sisko, Defiant Captain (ST2E 1 S 256) at the Tradeplace (38 haves and 5 wants). Click here to see all trade list entries for this Starter card!